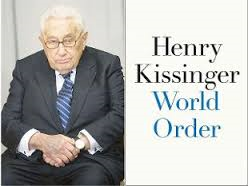 In this his latest article former Australian communist leader Eric Aarons dissects former US Secretary of State, Henry Kissinger's latest book, 'World Order'. Relating to his own experiences of the consequences of Kissinger's 'real-politick', Aarons criticises Kissinger in no uncertain terms. Henry Kissinger wastes no time in getting to the point of this important book from the first page. His aim is to restore the ‘World Order’ or ‘American Consensus’ that had been firmly established in the last decade of the 20th Century. Doing that, to which he himself had been closely attached, he might have thought of questions of his own reputation that would not go away. Kissinger wants to feature as the trusted and fearless adviser who, given the opportunity and means (sometimes as Secretary of State), would seek out the realities and truths of difficult international situations, even if the President did not like what he advised. Readers can make up their own minds whether or not Kissinger acted on this principle. As capitalism developed worldwide, so did the impulse for the formation of ‘states’ – that is, sovereign bodies of people holding a defined territory, politically ordered in a known way, and with a set of unofficial but powerful ‘rules of behaviour’ – a culture – that might also distinguish them from neighbours. States had therefore to make agreements at least individually with each other, hopefully with all . This was no simple matter because tradition had already become fixed on many relevant aspects of these matters in medieval and feudal times. The most important of these were the virtually endless wars within and between countries that had prevailed in feudal and medieval times, mainly centred on religion, but with land also in the picture. Capitalism featured competition, but also needed forms of cooperation to facilitate and promote business enterprise, while the new ‘states’ had only the traditional ones attached to the family, and thus to marriage relationships and rules of inheritance. These, though still featuring in relations between states, were inadequate for the task of setting general rules for relations between them. Henry Kissinger defines ‘world order’ as a state of affairs in which a majority of states reach some (peaceful) agreement on the conduct of the relations between them. – that is, what each of them prohibits or permits – what each of them may do or must not do. He places the origin of this concept in the Treaty of Westphalia (1648). which, concluding the ‘30 years religious war, providing an opportunity to begin a new era in which agreements instead of wars could establish some form of ‘World Order’ embracing at least most of Europe and the United States of America. This seems plausible, in that, following the universal war throughout Europe waged by Napoleon in the wake of the 30 years (religious) war, the treaty ending this period of history, had the opportunity to establish the principles that could guide, as justly as deemed possible, the principles that all nations might accept. Looked at soberly, and with due deference to the achievements of Westphalia, the sort of ‘World Order’ Kissinger holds up today as his preferred model is not worth the paper it is written on, and in any case has zero chance of coming into effect. It depends on the existence of one nation that stands above all the rest in military might, backed by a population that is ready to make the necessary sacrifice of lives, material treasure, and ethical probity (torture doesn’t fit here) to deal with wrong-doing by its citizens and those of other states. Chile was a major test for Henry Kissinger, in which he performed worse than miserably. By happenstance, I had a connection in the build up to this, having been elevated to a leading position in the Communist Party of Australia (CPA) after I had returned after studying three years in China. For internationalist educational purposes I was chosen, along with a journalist, Pete Thomas, to attend as observers of the Congress of the Chilean Communist Party in 1965. This was shortly after the Socialist Party leader, Salvador Allende had run a close second for President of Chile, and it was thought he would likely be elected next time. We had a number of assignments and instructions, including proceeding later to Moscow and discussing our worries about the growing split with China, Soviet treatment of writers and artists, the existence of anti-Semitism, and the unpersoning of Nikita Khruschev after he had let out the truth about Stalin’s dictatorship. There were difficulties in getting a flight from Mexico to Chile, so we did not actually attend the Congress, but had significant discussions with a number of the leading cadres, including about the likely behaviour of the Army. They told us that it had never intervened in Chilean politics before, and believed it would not do even if Allende did win the next election, but we urged them not to be too sure. Allende did win, and had begun making significant economic and political changes when General Augusto Pinochet led an army coup, surrounding the Presidency, and shooting dead Allende who had armed himself with a rifle and was shooting back on September 11, 1973. Thousands were immediately arrested and taken to a sports arena where they were immediately killed and/or tortured. Shortly after that, Pinochet invented the practice of taking captives up in a plane and dumping them directly into the Atlantic Ocean, and to this day there are ‘disappeared people’ being sought by relatives and loved ones. Kissinger assured Pinochet of his support, and to this day it is not clear whether it was President Nixon who had directly ordered Kissinger to arrange the coup, or had it suggested to him by the latter. Public Radio International (PRI) has a program (‘The World’) which conducted a long interview with Kissinger on the day marking the 41st anniversary of the coup, but said ‘when we raised the subject of Chile today, Kissinger cut us off.’ What other unsavoury secrets is he hiding? Kissinger declares now (September 11, 2014, PRI) that ‘he would not have supported the Iraq war if he had known then what he knows now’. He obviously asked only those favouring the war though there were plenty of prominent people thinking otherwise. He can only blame himself, but doesn’t. On December 6, 1975, Kissinger accompanied President Gerald Ford to Jakarta on a ‘friendly visit’. Next day, as their plane departed, the Indonesian President, Suharto, launched his army on East Timor, which had just been given its independence by Portugal. 200,000 East Timorese were killed, and many atrocities committed. The aim was to use East Timor as a launching pad to then annex the western half of New Guinea which was mineral-rich (In These Times April, 2000). Kissinger was also on the Board of the New Orleans based Freeport McMoRan gold and copper mine in West Papua, which was also notorious for its poor environmental record. The full story of the struggle for East Timor’s independence is too long to relate here, but the CPA had a proud record, and even John Howard eventually also played a part in it. The inadequacy of Henry Kissinger’s ideas of what a new World Order should aim for stands out. But the loss of the United States of America as the keystone of its arch of power is crystal clear, and is self-inflicted. Since Vietnam (1975), it has waged several major wars, and has not won a single one. Humanity must seek a new path, and the ‘battle for civilisation’ that Tony Abbott speaks about (The Australian, October 5, 2014) is far too limited to effect major change. The one example there is room for here, is outlined in a book The Sixth Extinction, well written by Elizabeth Kolbert (Bloomsbury). The title comes from the knowledge that there have been five major extinctions of life on earth caused naturally, but the sixth, now occurring, is self-inflicted. It is caused, says the author, by the fact that humans are changing conditions on earth more rapidly than most species can cope with, including many of us. The term ‘Great Moderation’ was used recently by economists just as the GFC (Great Financial Crisis) was about to erupt. Many humans, especially the top 1 percent who get as much as the rest of us put together (Oxfam), now need sufficiency rather than more; bigger is not always better, softer is often preferable to louder. . . I trust you will get my drift. Kissinger’s notion of a ‘New World Order’ included non-interference in each other’s internal affairs. Including choice of religion, political system, economic conduct and other similar arrangements, and general self-determination. This worked reasonably well for about a century , until it was violated by none other than Kissinger himself. It is not clear that was his decision, backed by various political leaders (particularly those of the United States,) that he had influenced. Again: this was to interfere in Chile’s internal affairs by prompting, then urging on an officer of the Chilean armed forces, General Augusto Pinochet, to stage a coup, overthrow and kill the newly elected President of Chile, Salvador Allende. By his silence on this issue of the Chilean coup, Kissinger re-endorses the views he expressed to Pinochet in 1976: ‘ We want to help, not undermine you. You did a great service to the West in overthrowing Allende ‘ (Wikipedia). The organisation Public Radio International (PRI) has a program called The World. Forty one years to the day after the coup – September 11, 1973 – they organised a long interview with Kissinger, but towards the end they asked him about Chile. They report That he cut them off without saying a word. Is he hiding or protecting a dead President?, hmself? Or both? Thankfully, Kissinger is no longer in the position of chief adviser and organiser of action for an American President . Even more important, times have changed, and humanity has more options, and especially no need of a new super-state, strong enough in weaponry, economic ascendancy, financial solidity and a fragile rectitude towards other states. With the rectitude, and a psychological disposition, to keep all the rest of the world’s nations in line. Public Radio International (PRI) also asked Kissinger about The Iraq war . He replied: “If I had known everything then that I know now, I probably would not have supported it.” An evasive reply if there was one. In fact, many people, some with actual knowledge, questioned the assertion that Saddam Hussein had nuclear weapons. Who did Kissinger talk to at the time? In any case, Kissinger’s interpretation of Muslim capacities, as he writes even now, reveals the dismissive, even contemptuous attitudes held by ‘leading’ American and many other westerners. They had better learn fast if they seek to construct a new ‘World Order’. So (in 1979) when an accepted state in the Westphalian system, turned itself into an advocate of radical Islam after thje Ayatollah Khomeini revolution, the Middle East regional order was turned upside down. (Page 149). I doubt that he saw this at the time (when he was directly attached to the White House). But, particularly now we have a situation deriving from that invasion in 2001, which has mushroomed into a major world-wide problem that has to be tackled on more than one front. The Australian government has decided on a half-baked war with the muslim world based on the atrocious practice of decapitating those they regard as enemies on full-view TV.